A flier’s new gig as an Alaskan bush pilot is impeded by hazardous weather, an arrogant inspector, and a hasty plan to rescue bear cubs in Auxier’s (Code Name: Dodger, 2012, etc.) adventure. All Daniel Christopher “DC” Alva has to show for years of flight training is a dreary job flying Grand Canyon tours. So he’s willing to brave unfavorable weather when best friend and fellow pilot, Allen Foley, gives him a heads up on an opening at Southeast Alaska Seaplanes. Working as a bush pilot gives DC access to superior aircraft and could lead to a major airline position. Unfortunately, in Juneau, Alaska, Federal Aviation Administration Inspector Frederick Bruner may have it out for DC, citing him for minor infractions. Add to that pilot Ralph Olafsen’s aggressive behavior toward Bruner, and Southeast Alaska is in danger of the FAA shutting it down completely. Complicating matters is a few pilots’ desire to save three bear cubs, orphaned by poachers but facing termination from game wardens—to save money. Allen, Ralph (sans pilot’s license), and others initiate Operation Dirty Harry to ensure that the bears return to the wild. Mother Nature, however, not to be tamed, takes down a Southeast Alaska flier’s plane, while DC will have to fight to make certain Allen doesn’t suffer the same fate. The novel possesses both suspense and drama in spades. Check airwoman Holly Innes, for one, hides from a menacing someone actively looking for her—and getting closer. Popular local Tonya Hunter, meanwhile, creates a rift between DC and Allen, amorously toying with the friends, and in true soap-opera fashion, DC’s pseudo-ex Stephanie (they “sorta broke up”) makes a surprise appearance in Juneau. There are disappointingly no strong women: Tonya’s aimlessly manipulative, Stephanie’s clingy, and Holly’s authority is undermined by male pilots (“Lady, you need to get laid,” Ralph tactlessly declares). But aviator Auxier’s intelligent and comprehensive descriptions of the story’s numerous flights, or characters discussing them, will put readers in the pilot’s seat. There’s plenty of context to help understand the jargon and an exhaustive glossary at the end, even including a few terms not in the narrative. 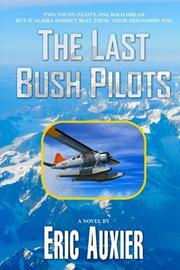 Romantic entanglements and a covert mission help this aviation tale take off.